Airbrush makeup is makeup sprayed onto the skin using an airbrush instead of being applied with sponges, brushes, fingers, or other methods. It is popular in film, theater, and sunless tanning; although systems designed for personal cosmetic use in the home are also available. Airbrush systems designed for these purpose are usually smaller and work at a lower pressures than systems used in industrial applications. The technique was first used in 1925 on actors in Ben Hur and has since grown in popularity in the entertainment business. Fact: Airbrushed foundation looks great on High Definition TV. Does it always look great in person? Not really. Depending on a person’s skin type, airbrush foundation applied with an airbrush machine can crack and separate on the skin. Once applied, airbrushed foundation is set on the skin until removed with makeup remover. All face makeup (concealer, blush, bronzer, and highlight) is applied under the airbrush foundation and with a heavier hand. So essentially, you are wearing way more makeup than necessary and you actually look like you have foundation on your skin which isn’t a desirable look for most brides on their wedding day. Any experienced Makeup Artist knows how to apply foundation traditionally (with a brush, sponge, or fingers) so it looks flawless and can make it last from your walk down the aisle through your last dance. If you are concerned with looking like you have a face full of foundation on, don’t be. There are so many different formulas of foundations out there from light coverage, to buildable/medium coverage, and full coverage. At your makeup trial, be specific as to the type of coverage you are comfortable with and I’m sure your Makeup Artist can accommodate you. If you like a dewy and fresh look to the skin (not matte), then you will prefer traditional foundation application. If you have a more oily complexion and are worried about getting shiny – ask your makeup artist to use a shine control makeup primer under your makeup and to set it with a translucent loose powder. That being said, traditional makeup applied by a professional will look just as good as airbrush makeup in photos and on your wedding video (even if it’s HD). 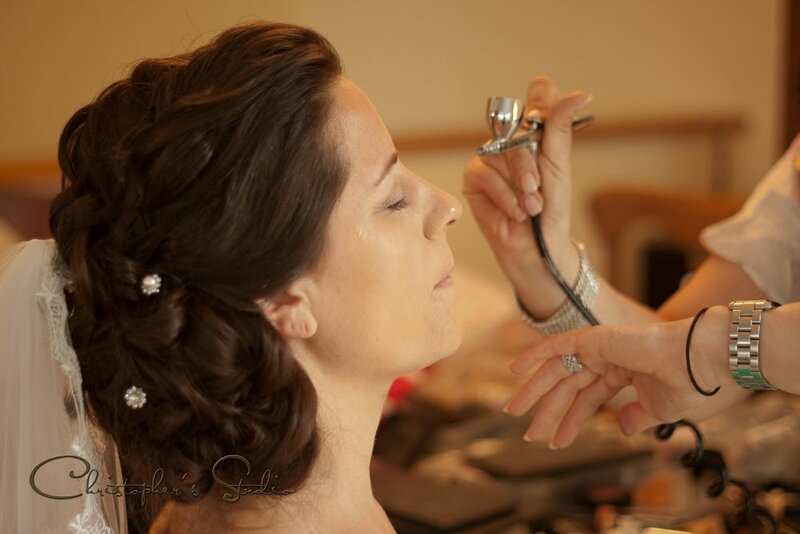 Brides tend to be interested in airbrush makeup because many celebrities use it on TV and for photo shoots. While airbrushing is popular and trendy, it can be more high maintenance than it’s worth. The biggest difference is the price. Airbrushing requires more time for application per person and more equipment and product for the makeup artist. Therefore, most Makeup Artists charge more for this service. My opinion, stick with traditional makeup on your wedding day so you look your best in person on your wedding day. Try airbrush if you happen to be on “My Fair Wedding” or “Say Yes to the Dress”!